In the good old days, mysteries were mysteries. Sherlock Holmes, that most rational of sleuths, would cast the light of reason on an apparently diabolical phenomenon, such as the Hound of the Baskervilles, and illuminate the prosaic truth with a dismissive “Elementary, my dear Watson.” (I know, I know! He never said it. My point is that Holmes invariably deduced a rational explanation.) I can’t remember any client bringing a supposed curse to Nero Wolfe, but if one had, Wolfe’s response would undoubtedly be “Pfui!” Ghosts and curses kept to the realm of the Gothic, werewolves and vampires to horror fiction, and elves and wizards to fantasy. The heirs of Agatha Christie and Raymond Chandler were strictly segregated from the heirs of Bram Stoker and Tolkien. Nowadays, many writers have taken to mixing genres in their cauldrons and coming up with some surprisingly palatable potions. Crime and the paranormal, in particular, can make surprisingly comfy bedfellows, whether the supernatural elements weigh in on the good-guy or the bad-guy side, or both. There are surely mystery purists who would argue that magic has no place in the annals of detection, that it’s cheating to allow the sleuth to rely on powers other than reason in conducting an investigation. There have always been purists in the mystery world. During the Golden Age of detective fiction, these would have been the folks who deplored any romantic entanglements on the part of sleuths. The puzzle is all, they cried. Messy human emotions only get in the way. On the contrary, without messy human emotions, we would have no crime and therefore nothing for crime-fiction writers to write about. Magic may not be essential to every story, but it can add elements of drama, surprise, fun, and imagination to a mystery without sacrificing the essence of the plot or the credibility of its characters. An example that springs to my mind is Charlaine Harris’s protagonist—nope, not Sookie Stackhouse, so let’s not get sidetracked into discussing the books versus the TV show or whether or not you like vampires—Harper Connelly, whose utterly believable world operates in exactly the same way as the real world, except for this little ability (being able to find the dead and know how they died) that she has as a result of having been struck by lightning. The mysteries Harper has to address come to her as a result of this ability, but she still has to use her brain to solve them. And the way the people around her relate to her is very much affected by their reaction to her ability. But those reactions, Harris’s skillful characterization convinces us, are precisely those that real-life people would have if they met someone with this ability in real life. Growing up in a household of card-carrying rationalists—both my parents were lawyers—I always had a secret hankering for magic. I still yearn for the utterly impossible, such as being able to fly, which, like the majority of us, I’ve experienced in dreams. But beyond that, in the category of extra-rational possibility in which some people believe and others do not, I long for the magic (telepathy, acupuncture, horse-whispering, the tunnel of light when we die) to be real, even as I’m stuck with my native skepticism. In fiction, whether as writer or reader, I get to enjoy having some of those dreams come true. 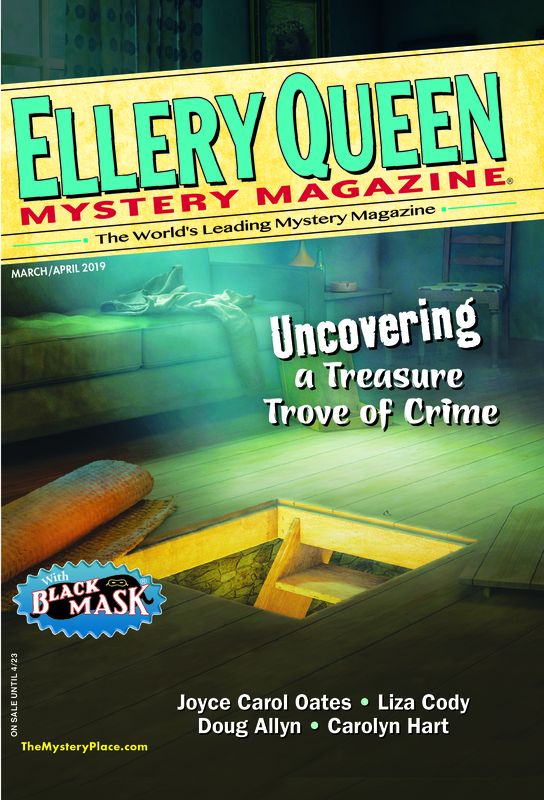 This entry was posted in Fiction, Guest and tagged elizabeth zelvin, ellery queen, elleryqueen, elleryqueenmm, fantasy, horror, lizzelvin, magic, mystery, paranormal, shapeshifter, supernatural, vampire. Bookmark the permalink. My second novel, THE GATHERING PLACE (1984), had a slightly supernatural element–bookdealer Rachel Hennings discovers she is able to sign the names of dead authors to their books–but otherwise stuck to mundane reality. Thus, I can’t complain too strongly about fantastic mysteries, but I have to admit psychic detectives, vampires, werewolves, and zombies are all red flags to me. There are just too many in the current market. However, I’ll add my usual hedge: any of the elements or approaches I don’t like are being used very well by somebody. There were some great points on this article. I agree with Jon L. Breen about there be too many of certain things on the market place. I feel that the mixing of genres depends on the skill of the writer and making the world they create convincing world instead of a surrealist experiment. Interesting piece, Liz. My horror novel, “The Thirteenth Child,” has elements of a police procedural woven into it, but remains firmly in the horror genre; perhaps because there is no supernatural aspect to the story. Even so, it illustrates your point about cross-pollination. Horror with no supernatural aspect, David? Can you elucidate? I thought they went together like a horse and carriage. The horror of the story comes from something unknown, but ultimately natural. I don’t mean to tease, but I don’t want to spoil it, either. Hopefully, it’s part of what will make the book unique. Sounds like material for another blog post: Does the rational belong in horror fiction? Quite a bit of Stephen King would qualify as non-supernatural horror. Good point, Jon, good point.